I'm back from the gorgeous island of Maui and I have to tell you we had the most amazing time. It was such a treat to spend the week in pure bliss! We soaked up the sunshine, took walks on the beach, did some sightseeing and ate at some of the best restaurants. Heaven on earth! I'll just give you some of the highlights from the trip so you wont get too bored looking at all my vacation photos. Although, you might want to sit down with a cup of coffee or tea, and I'll try not to make this the longest post ever! The Four Seasons treated us like royalty. You cannot go wrong with this hotel. Every little detail was perfection from the spectacular location, friendliest staff, amazing food and one of the best beaches Hawaii has to offer. We just about started weeping when we had to leave! Yes, it was that good. 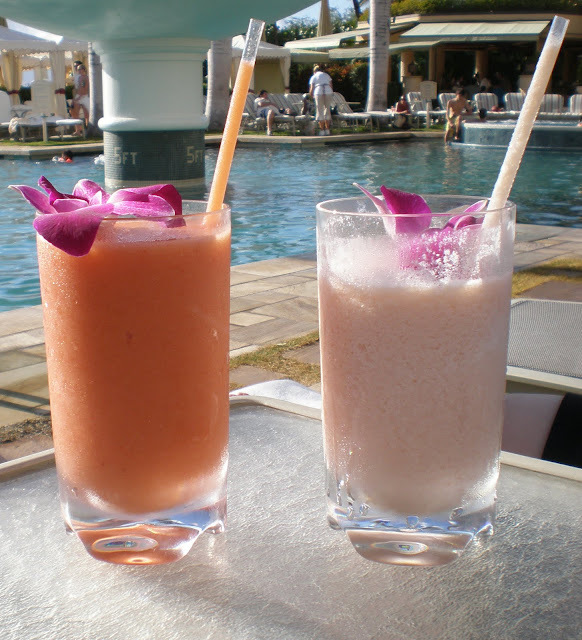 Drinks by the pool... yes, please! So there you have it, my trip to Maui in a nutshell, or should I say coconut shell. If you have never been to Maui you must put it on your bucket list. I promise, you won't be disappointed! It truly is paradise.